You may need to interchange left-right margin and/or lower-upper margin values if your LCD datasheet diagrams shows otherwise. Linux framebuffer drivers timing information is explained in detail at Documentation/fb/framebuffer.txt under Linux source tree. We will try to summarize this information here a bit. Following diagram shows which timing value from your LCD datasheet corresponds to which framebuffer settings. LCD datasheets generally mention about back porch, front porch and so on whereas Linux uses notation of margins instead. 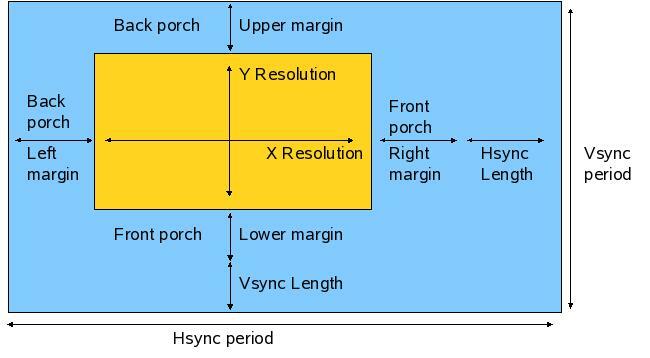 If your LCD uses hsync and vsync then you can easly convert LCD timing values to Linux display driver values using the diagram above. This page was last modified on 30 November 2011, at 11:31.